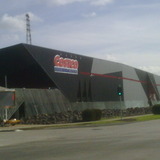 There are shops, big shops, wholesale shops and then there is Costco. An American import, Costco is still a bit of a novelty in Melbourne but it will go far, judging by the contents of my pantry that is. Located in Docklands, getting there can be a bit of an ordeal. The parking is free for the first two hours but parking spaces can be hard to find, especially on the weekend, so start the trip early. Let's be clear - if you are young and single with not a care in the world - then just keep patronising that 7-Eleven. Costco is definitely not for you. But if you are like me, however - a family man with four kids to feed and your weekly shopping barely fits into the back of a truck, then listen up because I am about to show you a new world. This new world is surprisingly well protected - to simply shop at Costco you need to be issued a shopping card (with photo id, no less) and pay a yearly subscription fee. Go on, open your wallet - you will be glad you did. Shopping at Costco is an experience like no other. Picture a supermarket blended with a department store, crossed with an electronics outlet and furniture section thrown in for good measure. Are you picturing it? Now multiply it by ten. Forget bite-sized portions. At Costco everything comes in king size. Boxes of tomatoes so large you can feed a platoon. Bottles of barbecue sauce so heavy, you will need a buddy just to put one in the boot (I am still using one of those bottles from a shopping trip six months ago). The good news is - those bulk purchase savings do add up. And with everything super-sized, you may only need to do the trip once a month or so. So go on, bring you truck and trailer, what are you waiting for? Did I mention shopping in bulk? Oh, right. I did. Why? Shopping at Costco is an experience like no other.